Dr. Stewart Chen was born and raised in Manila, Philippines. He came to the United States in 1979 and attended Bishop Heelan Catholic High School in Sioux City, Iowa. After graduation, he decided to pursue his dream of becoming a health care professional and attended Northwest Missouri State University, where he majored in Biology. He then became fascinated with the Chiropractic discipline and transferred to the Cleveland Chiropractic College in Kansas City. It was during this time that he met his wife-to-be, Lorie, who persuaded him to move to California. Dr. Chen moved to California and finished his Chiropractic studies at the Palmer College of Chiropractic in San Jose. After graduating in 1987, he took his State and National Board Examinations and was able to pass them the first time through. In 1988, he and Lorie decided to settle down in Alameda, CA to start a family and raise their children. They have lived on the east end of the island for more than 30 years and both their son and daughter have never known to live anywhere else. 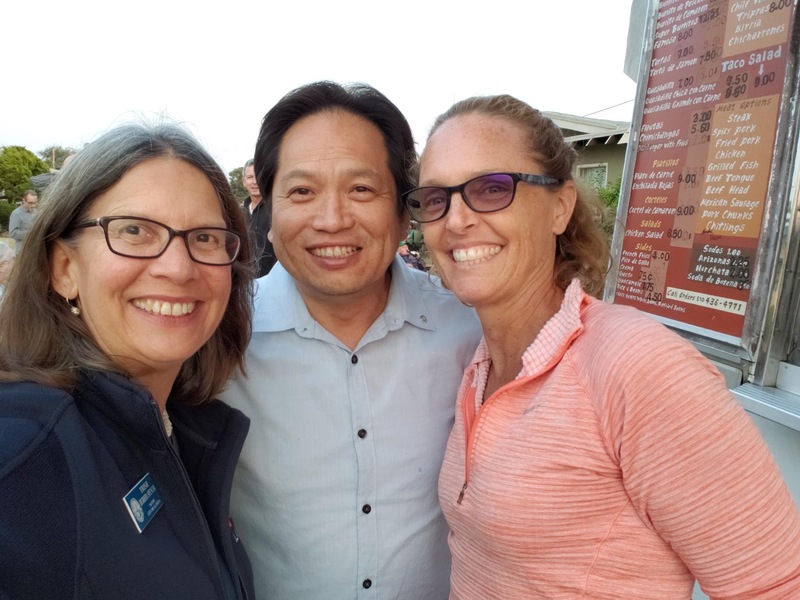 They believe that the city of Alameda offers excellent public services, such as public schools, and Dr. Chen would like to preserve and improve these for all residents to enjoy. Through the years, Dr. Chen has been an active member of the Alameda community. In 2010, Dr. Chen ran and was successfully elected to the City of Alameda Healthcare District (Hospital Board) where he served until he was elected to the City Council. He participated in the Alameda City-wide Needs Assessment survey and played an active role in the Mayor’s Fourth of July parades. He has chaired various committees including serving as Second Vice Chair of the Alameda County Human Relations Commission, Vice President of City of Alameda Social Service and Human Relations Board, and Chairperson of Alamedans together Against Hate (ATAH). 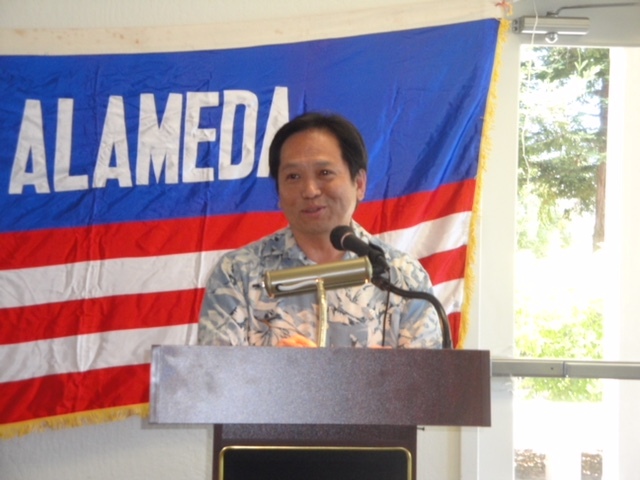 He also founded the Alameda Sister City Association (ASCA) and the Alameda Asian Pacific Festival. He was also one of the Directors of Alameda County Healthy Homes Joint Powers Authority and the alternate Commissioner to Alameda County Transportation Commission. Beyond the City of Alameda, Dr. Chen is also involved in various organizations in the City of Oakland, such as being the Board President of the Asian Cultural Center, member of the Asian Advisory Council on Crime, president of the Madison Square Condominium Association, Asian Pacific American Democratic Caucus, and Lions Club International. As a Doctor of Chiropractic, Dr. Chen has been in active practice since 1987. He specializes in musculoskeletal conditions and is certified in Manipulation under Anesthesia. Having a rich and diverse background means Dr. Chen is fortunate to be fluent in many different languages, such as: Mandarin Chinese, Cantonese, Taiwanese, and Tagalog. Traffic on the island has increasingly become an issue that impacts quality of life. The West End in particular feels like a video game at times. Knowing that the development we’ve seen in the last 10 years is a big contributor to this, and more development is already in progress, what do you feel is an acceptable level of growth in housing and cars over the next 10 years? How do we ensure that we’re better positioned for the next 10 years than we were for the last 10? Regarding traffic – I believe that traffic is a regional problem and we need to work with our neighboring cities to address this issue. We are also an island. Our only in and out is over the bridges and through the tunnel, so, consequently, at peak hours traffic can become a nightmare for our commuters. To mitigate our traffic congestion we need to get the Oakland- Alameda project (formerly discussed and dissected many years ago under the “ Broadway-Jackson project” rubric) going now with no more delays. Concurrently, we need to reintroduce and expand the Estuary Crossing shuttle service. In the recent past, this service provided crossings at no cost to the public and was an easy way to get to Oakland and its BART stations. In fact, I have taken the crossing a few times myself and was very impressed with it. This was a public-private partnership in which the county, city and private partners, like Wind River, provided the funding, and it should be revived in the interests of alleviating traffic congestion. Regarding Adequate Housing – For years we were in danger of falling out of compliance with the state housing mandate to achieve a “magic number“ and comply with Regional Housing Needs Allotment. Now that we have identified all the sites necessary to be in compliance with the mandate, we can take a breath and re-evaluate our position. Clearly, to suggest that we stop building homes altogether is in violation of regional needs as well as morally irresponsible, since as the population grows we owe it to the next generation to provide adequate housing. Having said that, we are an island and can only expand and accommodate a limited number of housing units. Thus, I would propose a controlled development at a pace that we can handle until we reach capacity. As for defining capacity, we currently have a population of 73,000 people. Can we accommodate another 10,000 another 15,000 or even 20,000? That is a question for the population and sustainability experts as they advise the Council. Regardless of this ultimate number, I strongly believe that we need to provide affordable housing, especially for our seniors and residents with disability. I have personally visited Jack Capon Villa, Waters Edge Nursing Facility, and the battered women shelter. They are a start, but we need to do a better job at protecting and housing our most vulnerable. I am also a strong proponent of providing affordable housing to the working poor, as well as for teachers, plumbers, mail carriers and the like, to allow them to live in the community in which they work. Public safety – I believe in supporting our police department so that they can provide us with the protection that we need. We had out first homicide this year on Webster Street, where a woman was robbed and killed in front of her own restaurant. Not only do we need to fully staff our police department, but I pledge to modernize public safety in the future, and push for policies to provide the best tools and techniques to make our communities safer. In addition, we all need to get involved and watch out for each other. I personally have worked within a couple of neighborhoods, training residents on the use and applications of radar guns, and I was a key witness to a robbery and fatal shooting and provided with police with information that lead to the arrest and closure of the case. What is your position on bilingual services? My wife and I immigrated to the United States 40 years ago. The only difference between my US citizenship and that of a native born citizen is I had a choice, and I chose to become a US citizen. Like all Americans, I have to pledge my allegiance to the flag and the United States Republic for which it stands. As the only truly bilingual candidate in this year’s election – and not just the city council race, but all the races in Alameda – I am the only candidate from the immigrant community. We are a nation of immigrants and a basic democratic principle in America is the right to immigrate and seek citizenship. Diversity does not only mean gender and ethnicity, but also diversity in family background, in religion, in culture, in education, and in experience. I will bring a different and important perspective to the City Council. Our nation was built on the backs of immigrants, and I believe that without legal immigration, our country would not be nearly as strong as we currently are. Can you imagine if immigrants like Albert Einstein, John Muir, Jerry Yang of Yahoo, Steve Chen of You Tube, or Elon Musk of Tesla had not chosen to become Americans? Likewise, we have athletes and entertainers like the Terminator, Steve Nash and Dikembe Mutombo, and even our first lady is a foreign born American, whose immigrant parents have recently become citizens. A top priority for me is to expand and improve the quality of life for all of our residents Alameda’s population is currently about 45 percent persons of color, and a significant portion of this percentage is residents who are foreign born citizens or non-citizens. This immigrant population has traditionally been underrepresented in city hall, both in elected offices and on our many boards and commissions. One result of this has become clear as I walk precincts, where I have met and spoken to countless new residents, often with limited English proficiency, who are afraid to seek for city services because they do not understand the system or do not know who to turn to who can understand them. Repeatedly, they ask me questions that can easily be answer by a call to city hall or a few strokes on the keyboard. This has made me realize that we, as a city, need to provide a program of bilingual services to our residents, especially our most recent newcomers. Before I can give you my support, can you give me your position on the following topics? 1 Where do you stand on increasing the sales tax to support an inflated city budget? 2. How do you feel that the council has paid thousands to two past city managers for their mistakes? Ron Goode Toyota was one of our larger sales tax revenue source, if not the largest sales tax contributor. After the dealership left, our sales tax revenue has been hovering at around 9 ½ million dollars, and this figure represents about 10% of our annual budget. I strongly believe in increasing our sales tax revenue, but not in taxing our residents and visitors. Measure F will do just that and I am not supporting it. The City Council is the policy making body of the city. Council members cannot and should not interfere with the day-to-day operations of the city or micro mage the City Manager. I’m very surprised and disappointed to learn that you are a “yes” on Measure K. Would you mind explaining why? First of all, I am not supported nor endorsed by the tenant or landlord groups. I am running an independent campaign and this is how I see measure K. It took countless stakeholders’ meetings and years of collaboration to create our unique “Rent Stabilization Ordinance” that affords protection to our tenants. I, along with the majority of Alameda, truly believe that our rent stabilization ordinance balances interests of both the tenants and landlords and is a fair compromise; the majority of our voters overwhelmingly supported Measure L1. Leaving the decision in the hands of five council members to change City Ordinance 3148 at will is a risky decision. I agree with Mayor Spencer in supporting the charter amendment.